The most common form of interment today remains underground burial with a casket. Many cemeteries require the use of an outer burial receptacle designed to receive the casket and capable of withstanding the weight and pressures of the earth above and around it. This requirement is essential for the beautification and continued maintenance of the grave and the cemetery grounds. The burial vault is a sealed outer burial receptacle which protects against moisture, the weight of the earth, and the elements, in a subsoil situation. 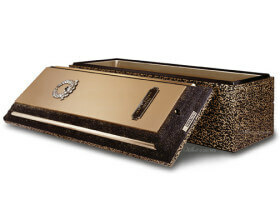 Vaults are typically sold by funeral homes and cemeteries.